Sometimes, when you’re following a low-carb high-fat diet, you can get everybody in the family to follow it with you the same way. My husband I have been following a low-carb high-fat diet for a couple of years now. And we’ve both gone on and off occasionally. Usually it happens at the same time for both of us. If stress is high, and he’s feeling like a little treat, chances are I will be as well. In any case, the emotional support of having somebody else following the same eating program is helpful, and cheating together is part of the emotional bond sometimes. However, sometimes only one of us feels like taking a day off. The question is, should the other be supportive and also take a day off, or is it better for the relationship and for our health if each of us chooses based on our own needs at the time? Some might say cheating together is a codependent tendency, reminiscent of alcoholics and their relationships. A situation like that came up this week. My husband was feeling a little bit stressed, and we had had kind of a loose weekends diet wise. (It happens. You just get started again.) I came home in time for dinner, looking forward to some of his delicious roasted chicken, and he told me he had just had an ice cream bar, and he wanted me to make him some chocolate chip cookies. Of course, we hadn’t discussed cheating beforehand, and I had been following our eating plan comfortably all day. But we’re always very honest with each other if either one of us decides we’re going to take an unplanned cheat day. It makes it easier to be on a diet together if you know that the person you’re with isn’t somebody you feel you have to hide anything from. I believe that maintaining that level of honesty is part of what distinguishes our approach from a codependent relationship. He loves my chocolate chip cookies. As I’ve mentioned before, I had been baking for years before I started following a low-carb high-fat diet, and I’d developed a number of techniques to enhance the flavor profile of foods that combine carbohydrates and sugars. It’s not all that useful on this diet, but it is still a skill I’m proud of. And baking for someone who appreciates what I’ve made is something that I enjoy. Besides, when your husband asks you with that look in his eyes to please make him some chocolate chip cookies, how can you possibly refuse? So after enjoying some chicken thighs for my own dinner, I went down to the kitchen and pulled out the sugar, the flour, and the chocolate chips. Not to brag idly, but I can practically make chocolate chip cookies in my sleep. The problem is, after years of baking, part of that mindless process always involves tasting the ingredients as I go. Mix the sugar and the butter, have a taste. Add the eggs, vanilla, and salt, have a taste. Mix in the flour and baking soda, have a taste. Taste the chocolate chips before putting them in. Taste the dough after the chocolate chips have been added to it. Have another taste of the dough while shaping the cookies, because it’s cookie dough, and cookie dough is delicious. Scrape the extra dough out of the bowl with a spatula while the cookies are baking, then pick the last bits of dough off the spatula and the mixer blade. Then taste the cookies while they’re still hot, just to make sure, because even though you’ve done this a million times, who knows? It could be different this time. It never is, but it’s an excuse taste the cookies. The process happens without even thinking, and it’s so automatic that interrupting it feels artificial and awkward. 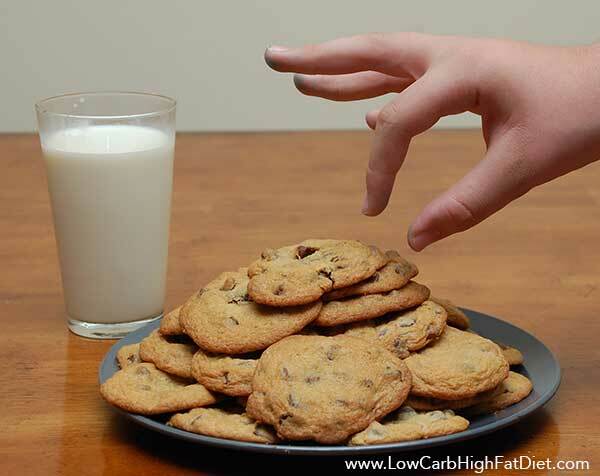 Even when you have no appetite for sweet foods, and you know that the carbohydrates would make you feel sick if you ate them, the impulse to taste everything that you’re baking is such a habit that it takes conscious effort to stop. But congratulate me. I managed to make it through the entire process of baking and serving chocolate chip cookies to my husband without putting so much as a single chocolate chip in my mouth. And reportedly, the result was just as good as if I had been tasting every step along the way. I wouldn’t know. I didn’t taste them. So yeah, I’m bragging. But I’m also hoping some of my readers can resonate with this experience of sticking to their diets when those around them are having trouble doing the same. Just believe me when I tell you it is possible to let your own health and your own appetite be your guide. Following a low-carb high-fat diet suppresses your appetite, but it doesn’t change who you are or the habits that you bring to your lifestyle. Just have faith that you can break your old habits, benefit from the appetite suppression that comes naturally with a low-carb high-fat diet, and take care of your family’s needs while still taking care of yourself.